Smooth, flicker-free dimming to darkness for constant voltage LED lamps or strips. Dimming control input 0/1-10V signal. DALI interface available. Supplied with 20cms flying leads. Smooth, flicker-free dimming from maximum to darkness. Can be positioned up to 20m from the LED light source(s). Dimming via 0/1-10V input control signal. 12V to 24V +/- 10% DC. Weight: 44g. Dimensions: W:38mm D:15mm L:50mm. Multiload can supply the power supply if required. When the RPC series is wired to one or more LDX101, the lighting circuit can be dimmed to darkness. If mains switching is required use LC series of Lighting Contactors (for additional information on LC series see here). 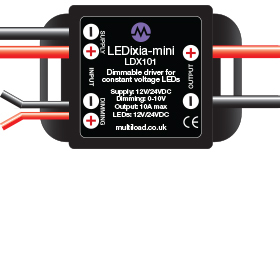 LDX101 can be used with any third-party lighting control system that provides 0/1-10V control signals. DALI interface available.